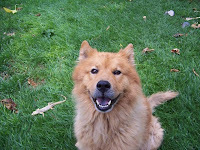 My 14 year old Chow, named Red Dog, fell sick about 15 days ago with some kind of terrible stomach infection. He was heaving and vomiting the first day, and then went completely lethargic the second day. He couldn't eat or drink or even stand up. He just laid there. And honestly, I figured he wasn’t going to make it, since he was so old and the infection had just wiped him out. No strength left whatsoever. Since he wouldn’t eat or drink, there was no point in adding colloidal silver to his water bowl, or to his food. The only way I could get colloidal silver into him was with a plastic syringe (with no needle). I just kept filling the syringe (10 ml) with 20 ppm homemade micro-particle colloidal silver, and then squirting it into his mouth. I'd give him three or four syringefuls at a time, since he's such a big dog. And I repeated this three or four times a day. At first, he wouldn't even swallow. In fact, he'd clench his teeth shut in resistance. I literally had to hold the syringe tip up against his clenched teeth, and try to squirt the silver water into his mouth between his teeth. But after awhile he started willingly swallowing the silver water as I'd squirt it into his mouth. I did this for three days straight. On the second day he got up and moved around a bit. But he still wouldn't eat. On the third day, however, he got up and moved around quite a bit more (albeit with difficulty). And later that night he was doing so much better, he started drinking water again, and he actually ate a full meal with our other dogs. By the fourth day of treatment, he was doing much, much better – back up running around and following me wherever I’d go. Coincidentally, we had a film crew out to the house to help me do some little video shorts on various aspects of making and using colloidal silver. So they were able to film me giving Red Dog colloidal silver with the syringe, and discussing alternate ways to treat pets with colloidal silver. The videos should be ready in mid-September. And of course, I’ll not only post them to my YouTube channel, but I’ll post them to the “Videos” page at TheSilverEdge.com, and post links to them on the Colloidal Silver Secrets Community on Facebook, as well. Plus, I’ll send the links by email to all readers of the Colloidal Silver Secrets ezine. In the meantime, you can learn more in my older article, Colloidal Silver and Pets. By the way, Red Dog is doing just great. When I go outside, he follows me around everywhere. I think he actually liked being babied during the four days he was sick. But more than that, I think he actually appreciates being alive! I can tell by the bounce in his step and the way he wags his tail when he sees me now. Looking at him now, you’d never know he was so sick. The difference between how he looked ten days ago, and today, is astonishing. Had you seen him at that time, you’d have sworn he was on death’s door prior to the colloidal silver treatment.